Information about construction, energy, power, and conservation. Also including a time log of progress on the construction. (See what's new to track changes.) These pages are a guide for ourselves, our friends, but most importantly our architects and contractors. These pages are a history of our house building project as well as a working document on our plans and our questions that we need to resolve as we move forward. The energy and construction pages summarize what we have learned about how to build a house that is as carbon neutral as we can make it. They are meant as a resource to others who share our concerns about the need to reduce our nation's reliance on fossil fuels and are interested in building energy efficient houses. Part of a set of pages devoted to building an energy efficient house. As the building progresses, we are now able to focus on ways to conserve water and energy outside as well as inside the house. Minimizing water usage both inside the house (see appliances) and outside the house is a goal that seems strange in a house right next to a great lake, but none-the-less is important. A useful guide to water conservation comes from the California Urban Water Conservation Council. Inside the house, low flow showerheads and dual flush toilets cut down water consumption. The H2ouse.org web page points out that instant hot water does not actually seem to save any water (and probably increases energy usage because of heat loss to the system). One technique that would be useful in the garden is "rain harvesting". Caroma toilets, manufactured in Australia but available in the US, offer dual flushing, with a .8 gpf for low and 1.6 gpf for high. Runoff from driveways is typically diverted into storm sewers rather than into the ground. An alternative is the use of porous or grassy pavers that allow the water to be absorbed into the ground. Samples from Scotland and Germany show some of the possibilities. By using such tiles we will reduce surface runoff at the cost of increasing the subsoil water table. (See the Nemo project, Nonpoint Education for Municipal Officials, web page for a discussion of how to prevent runoff and further considerations of municipal planning for water use). 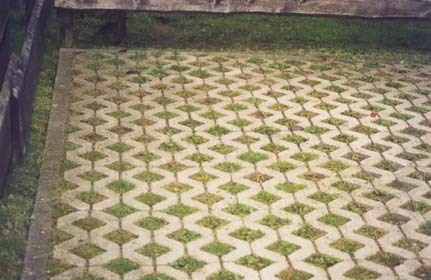 Grass pavers can be made of plastic (e.g., Grassy Pavers(TM)) or concrete. The NEMO page has a comparison of different products One decision is between concrete and plastic pavers. Most plastic grassy pavers seem to be made of recycled plastic. Invisible Structures has an interesting web page showing their product being used for parking lots at football stadiums and malls. 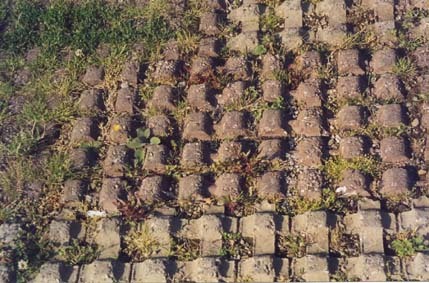 Examples of concrete grassy pavers used in Europe. An alternative to having the runnoff go to the lake or the sewer is to have a larger catchbasin/cistern that then slowly releases the water to the soil. Such cisterns can become contaminated with bird droppings and other pollution on the roof, but techniques such as SafeRain allow one to divert the first amount of water and then catch the later runoff. A garden water saver diverts the water from the normal downspout to fill a tank. When the tank is full, the water is then allowed to run directly down the downspot the the standard drain. Consider a 1 inch rainstorm: 2500 square feet results in roughly 200 cubic feet of rain water or 1,500 gallons. If this water were then slowly released to the garden over the next several days rather than running into the sewer and lake it would help the garden and lake. Slow drainage could be achieved by the logical equivalent of a septic field distribution system. How would this work? Recessed tanks, lined with cistern liners under the front porch and lake side terrace would be slightly above the current grade. This would allow them to fill from the rain spout/gutter system and then slowly drain into the garden areas around the house. This is consistent with the original engineering drawings, but replaces the retention tank at the low point in the yard with several closer to the house. How big should such containers be? Assuming that the terrace is roughly 200 square feet. Then a two foot deep container would be able to catch all the flow from a 2 inch rain. This container would be supplemented with a 12 foot by 6 foot by 2 foot (144 cubic feet) container under the front porch. An alternative location for the collection tanks would be under the solar collectors by the garage. This would allow for easier access if it were necessary to clean the tanks.